How to Paint Roses on Glass one easy stroke at a time. I show you step by step out to paint beautiful glass pieces. Beginner friendly. 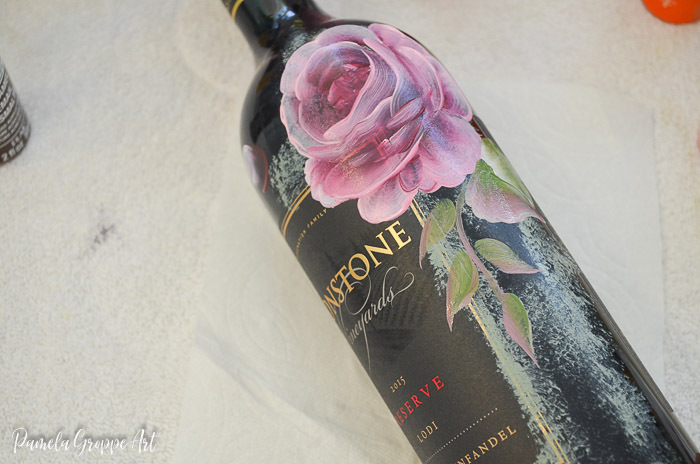 I show you how to paint roses on glass easily. 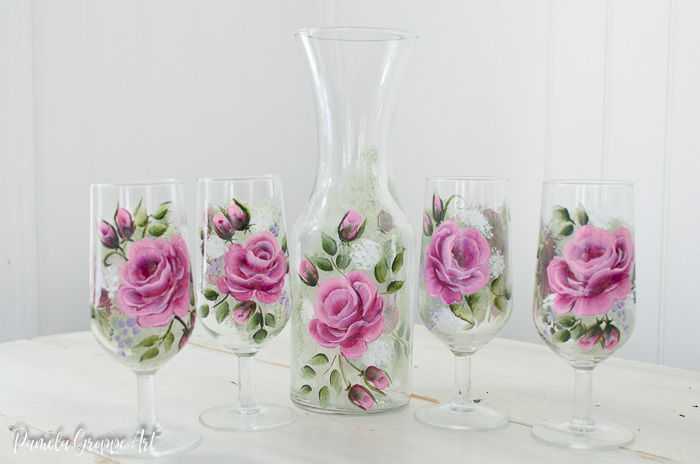 Create beautiful painted glasses, bottles and vases using this step by step video lesson. I absolutely love painting on glass. Truthfully, I enjoy painting on many things but glass takes it to a whole new level. This is a wonderful way to up-cycle glass ware from the thrift store as well as new. 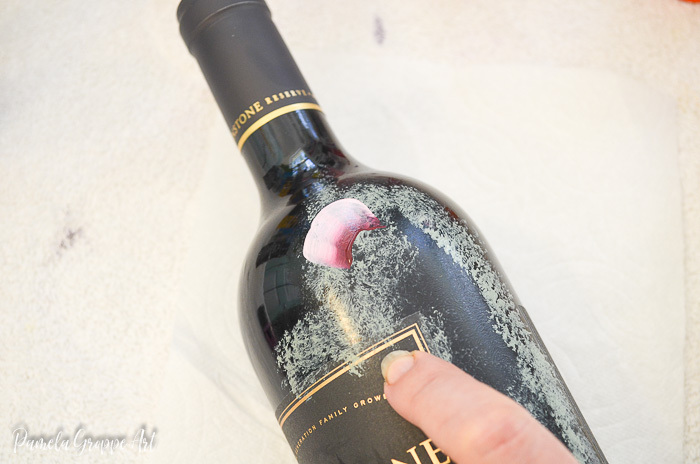 A few tricks to get started make it much easier for the beginner painter to paint on glass. It can be a bit tricky until you get a feel for how the enamel paints work on glass and getting opacity. After the under painting is dry you can paint your strokes easier and layer them as in most other painting techniques. The leaves and vines are easy as well and can be added before the roses or after. Painting wine glasses to match is just as easy and the combo makes such a beautiful gift. 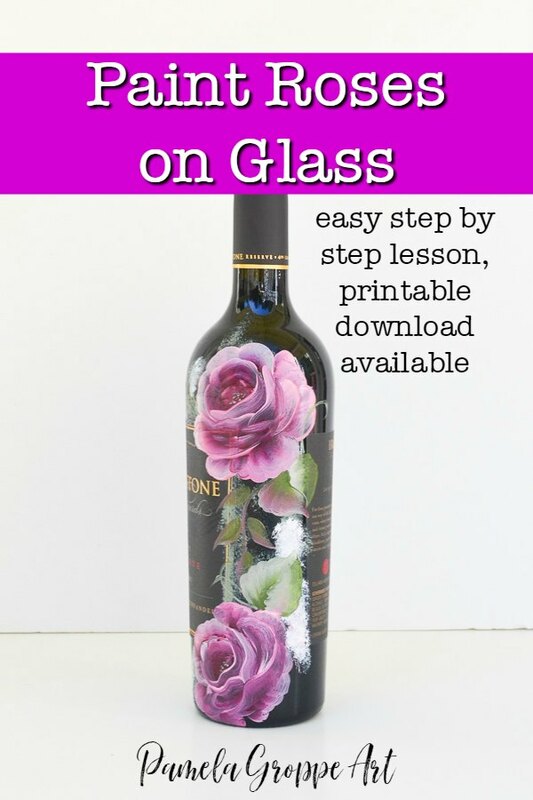 If you want a downloadable e-Book of how to Paint Roses on Glass, just go here to get yours! You may have seen my latest workshop Painting Lavender and Monarchs but the roses are where I got my start. I think you need to give painting on Glass a try. Careful though, it can get addicting! Want the printable e-book with rose painting worksheet? You can find that here. It takes you step by step with photos through this entire process. Let the paint dry for 24 hours then place in a cold oven. Set the temperature to 350 degrees and bake for 30 minutes. Start the timer once the oven reaches temperature. Once the glass items have baked for 30 minutes, shut off the oven, don’t open the door and let cool completely, then remove from oven. Hi Pamela,,,WOW!!!!! When I saw your roses on glass all I could think was WOW!!!! you’ve come a long way!! !They are breathtaking!! !,,,I’ve been painting for more years than you are old,,however the one thing that I could never do was a rose,,my favorite flower,,,and I saw yours and thought if I ever could learn the rose it would be with your lessons,,,you have a very relaxing way of teaching and I felt this was for me. I’m still working on it tho,,cant figure out what the heck is so different about a rose that my brain cannot get it,,,,sssooo frustrating!!! However,,I’ve vowed to master it especially when I saw the wine bottle!!!!! THANK YOU,,,THANK YOU!!!!! Thank you so much Dolores, I do love to paint roses and I kept at it until I loved what I did. One thing is for sure, no two ever turn out exactly alike. All I can say is to keep at it until your brain latches on and before you know it they will become second nature. I just love how they turn out on the bottles and glasses too. I need to do more! Здравствуйте Памела! Посмотрел Ваши работы в пинтерест просто завораживает приятный колорит. свободная и мягкая хотя я не раз это видел. Вы знаете для себя хочется попробовать, давно кисти в руки не брал. Еще раз СПАСИБО !!! Александр Сорока. Love these! I have always been intimidated by glass. I tried Christmas ornaments once and it was a disaster. But seeing these, I’m ready to try again!!! Thanks for sharing! I have wanted to do more glass painting tutorials, summer is garden time but Fall will be here soon enough and more painting will happen. 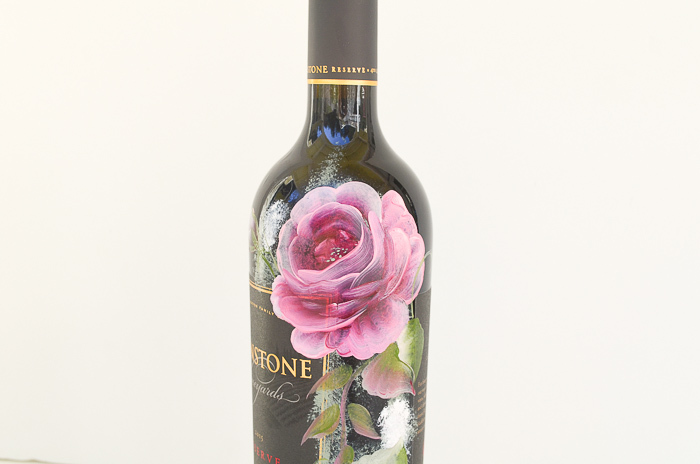 I have a friend I would love to paint a wine bottle for her for Christmas. My only concern: Since you cannot cure the painting in the oven, if you use enamels for glass, will it eventually chip? You can let it air cure, which takes 21 days minimum. But there are other concerns. Is this an empty wine bottle or full? Will the wine bottle be put in the refrigerator? Condensation can cause the paint to peel off from the moisture coming from beneath the paint. If it is for a very brief time normally there would be no issue. Pamela, could you do a painting of red Rose’s? I’m having trouble picking colors that will distinguishe the different layers!! I know I can do it with your instruction. I just love your Rose’s even better than Donna Dewberry!! Thanks for all the sharing you do!! Love it and have tried it! Not as good as yours but it wasn’t bad and the person I gave the wine to was absolutely thrilled! After she drinks the wine it will then be a dish soap container! 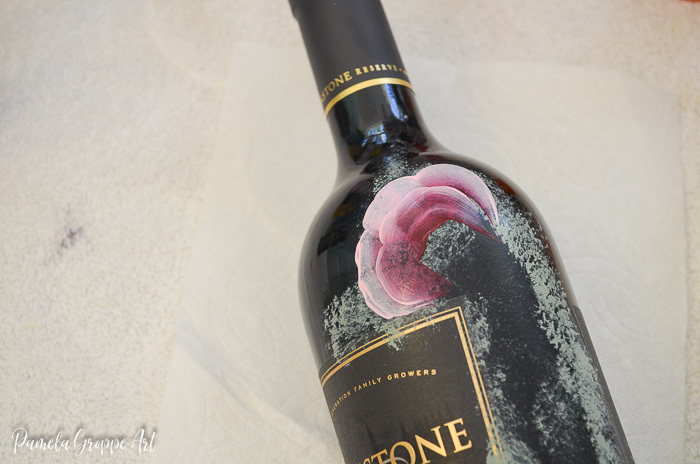 I did several coats of mod podge to cover the entire bottle! Thank you for your sharing!! Is the eBook still available for the “Painting Roses on Glass”, please. I have tried to find it but to no avail. I absolutely love your wine bottle and wine glass set. Are you by any chance selling these? If so, for how much? I create a lot of my own Art on bottles. I love your flowers so much, I would like to learn how to do these myself.